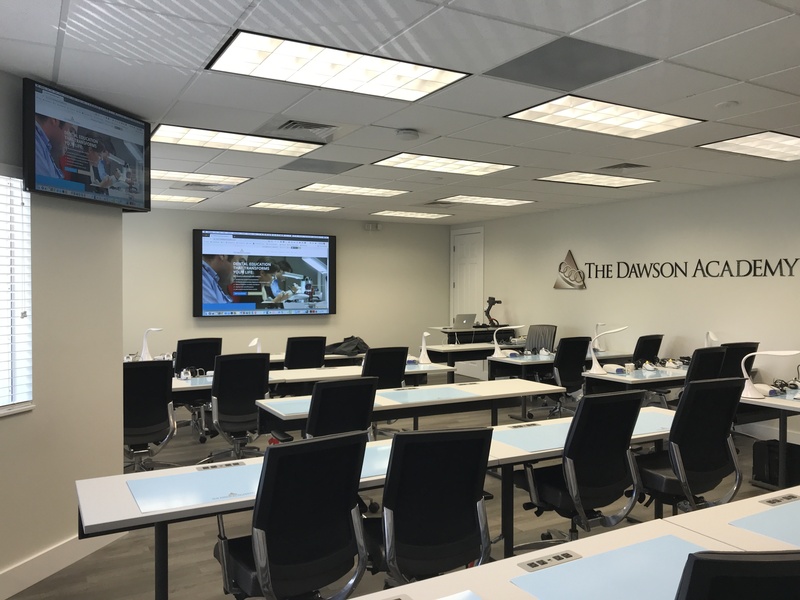 The Dawson Academy of St. Petersburg, FL is a postgraduate educational and clinical research facility, dedicated to the advancement in dentistry. As a 20 year client of Encore, we are proud to enhance their teaching practices and believe this installation delivers exactly what the customer desired. This training room installation was designed to make it easy for instructors to seamlessly switch between presenter laptops, a document camera, and a Barco ClickShare wireless collaboration hub. This allows participants and instructors alike to share their laptop, tablet, and phone screens using a USB dongle or iPhone or Android app. 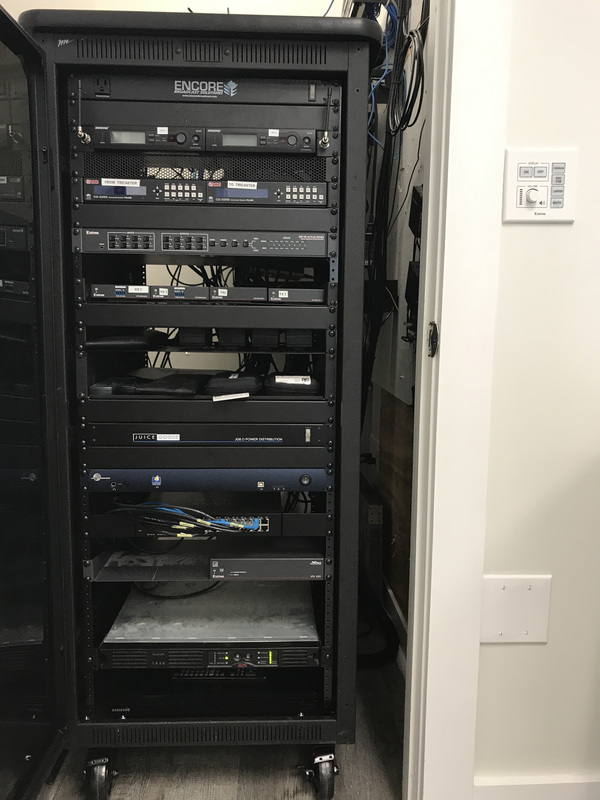 Switching/Routing is accomplished using the Extron wall plate and Extron 4x4 Matrix, which are programmed to control all installed devices over a Local Area Network (LAN.) Buttons are programmed to turn the monitors on, set their inputs, route the video sources to the monitors, and route audio through the Aspen Digital Signal Processor. This incredible Lectrosonics processor is programmed to deliver a smooth and professional audio sound field within the classroom space. The goal was to simplify the instructor experience, while maintaining maximum user impact. The teacher’s desk contains Beyerdynamic MPR211 B wired microphones, two Shure lavaliers, as well as, a hardwired input in case the Barco ever fails. The main monitor, a 98” NEC LED, delivers crisp high-definition text, graphics and video, from the front of the room to the rear. That, along with other equipment including two 43” Panasonic monitors, Wolfvision VZ-8Plus4 document camera and a Sony PTZ camera are sure to convey an excellent classroom experience. I have been working with the Encore team for over 20 years. I appreciate their customer service, attention to detail and outstanding knowledge. Dennis and Joe always do what's best for my company. I highly recommend them.